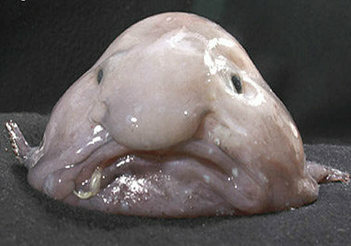 The public voted the blobfish the world's ugliest animal. It will now serve as the mascot for the Ugly Animal Preservation Society. The blobfish lives off the coast of southeastern Australia and Tasmania at depths of 2,000 to 4,000 feet, according to Simon Watt, the biologist and journalist who organized the vote for the ugliest endangered animal. In a scientific interlude that comes at the end of Foot's video plea, Watt says the blobfish's body is made of a gelatinous material that is just a bit more dense than water, allowing it to bob along in the deep sea without having to work hard to keep afloat. According to Watt, the blobfish eats crabs and lobsters, mostly by just opening its mouth and allowing food to float in. That diet puts it right in the way of the deep-sea nets cast by local fisherman. 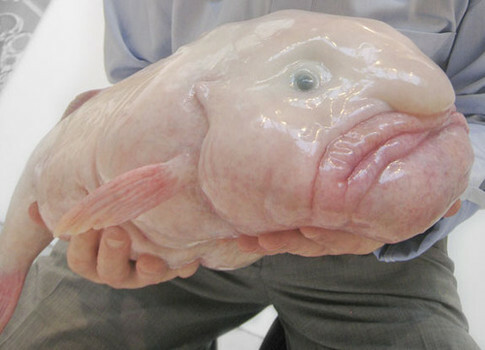 Winning the ugliest endangered animal vote makes the blobfish the official mascot of the Ugly Animal Preservation Society. The "society" is really a touring comedy night that Watt put together, where science-minded comedians -- and a few comedy-minded scientists -- each champion an ugly endangered animal. At the end of the show, the audience votes on which ugly animal will be the mascot of their regional chapter. At the end of the summer, Watt teamed up with the British National Science and Engineering Competition to put the show on the Internet, creating a YouTube page where viewers could watch 11 comedians describe 11 ugly and endangered animals, including the proboiscis monkey and the axolotl. Votes were tallied according to which video got the most likes. But it was really no contest. The blobfish won hands down, Watt said.